Rainfall Forecast issued by India Meteorological Department indicate that Heavy to Very Heavy rainfall with extremely heavy fall are very likely to occur in East Rajasthan (next 48 hrs), West Madhya Pradesh (next 48 hrs), Gujarat, Konkan & Goa (next 72 hrs), Coastal and Ghat areas of South Interior Karnataka (next 48 hrs). 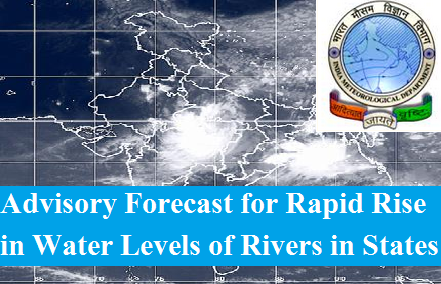 Due to this rainfall, the rivers Mahi, Sabarmati, Banas, Godavari and its tributaries, Krishna & its tributaries, West flowing rivers south of Tapi, Cauvery and its tributaries are likely to rise and create low to moderate flood in few locations. Mahi Basin: River Mahi and its tributaries are likely to observe rise in water levels in districts of Jhabua and Dhar in Madhya Pradesh, Dungarpur, Banswara in Rajasthan, Panchmahal, Mahisagar and Vadodara districts of Gujarat. The inflows into Mahi Bajaj Sagar, Som Kamla Amba Dam, Dhariawad, Jakham, Kadana Dam and Wanakbori weir are likely to rise. Present Storage of Mahi Bajajsagar, Som Kamla Amba dam and Kadana Dam are almost more than 90% full and releases if any due to this heavy rainfall warnings have to be done taking into account the downstream conditions and with prior information to all downstream states and districts. Sabarmati Basin: River Sabarmati and its tributaries in districts of Udaipur, Sirohi, Pali and Dungarpur in Rajasthan Sabarkanta, Mehsana, Ahmadabad Gandhinagar and Kheda districts of Gujarat are likely to observe rapid rise in water levels. Dharoi dam in Mehsana district of Gujarat is having storage of 90% of its capacity as on 28th August 2017. Hence release if any may be done judiciously taking into account rainfall conditions in the downstream reaches. Banas Basin: River Banas and its tributaries are likely to rise rapidly in the districts of Udaipur, Sirohi districts of Rajasthan and in Banaskanta district of Gujarat. Dantiwada dam on river Banas and Sipu Dam in Banaskanta district of Gujarat is having storage of 94% and 86% respectively as on 29th August 2017. Hence release if any may be done judiciously taking into account rainfall conditions in the downstream reaches. There is likelihood of heavy rain in Kutch areas of Gujarat and in Morvi, Rajkot, Bhavnagar and Jamnagar districts of Saurashtra and Kutch also. Since most of the dams in these areas such as Machchhu-I and II, Und etc are very near their full levels. Very strict vigil may please be maintained for the safety of the structure as well as downstream areas in association with the rainfall likely to occur during the next 3 days. Narmada and Tapi Basin: In view of the likely rainfall river levels of Narmada and Tapi are likely to rise in districts of Hoshangabad, Khargone, Indore in Madhya Pradesh and Narmada and Bharuch districts of Gujarat in Narmada. River Tapi is likely to rise in Betul district in Madhya Pradesh, Jalgaon district in Maharashtra, Tapi and Surat districts in Gujarat. However, the rivers may not cross the Danger Level in any of its reaches. The storage at Hathnur Dam is around 66% and at Ukai Dam is around 45% as on 29th August 2017 and hence the rainfall may increase the storage in these reservoirs. Damanganga Basin: Due to the expected rainfall, River Damanganga and its tributaries is expected to rise in Nasik district of Maharashtra, Valsad district of Gujarat and Daman district in Daman and Diu Union Territory. The storage at Madhuban Dam in Valsad District is around 67% as on 29th August 2017 and hence the rainfall may increase the storage in the reservoir. Godavari Basin: River Godavari is likely to rise in Upstream reaches in district of Nasik, Ahmednagar and Aurangabad district as well as in Parbhani and Nanded districts of Maharashtra. Due to rain in South Chhattisgarh, river Indravathi is flowing in Moderate Flood Situation at Jagdalpur in Bastar district and is likely to rise in Dantewada, Bijapur district of Chhattisgarh. Very near to low flood situation is likely in Nizamabad, Jayashankar and Bhadradri Kothagudem district of Telangana and in East and West Godavari district of Andhra Pradesh. Krishna Basin: River Krishna and its tributaries are likely to rise in upstream districts of Satara, Sangli, Kolhapur, Pune, Sholapur districts as well as in Bagalkote, Vijayapura and Kalaburagi district on Krishna and in Chikmagaluru, Shivamogga and Ballari districts on river Tungabhadra in Karnataka. West Flowing Rivers: Rivers flowing West into Arabian Sea south of Tapi in Maharashtra, Goa and Karnataka are also likely to rise and inundate areas in Raigad, Thane, Ratnagiri and Sindhudurg districts of Maharashtra and in Uttara Kannada, Udupi and Dakshina Kannada districts in Karnataka. Traffic along the old road and rail bridges along these river reaches have to be strictly regulated. Urban Flooding in Mumbai: Due to very heavy rains and the likelihood of continuing of rain in and around Mumbai, there is likelihood of severe inundation in urban areas of Mumbai City. Necessary precautions to be taken especially in lakes surrounding the city and the releases if any have to be regulated taking into account the downstream conditions. Cauvery Basin: River Cauvery and its tributaries in upstream reaches in Kodagu Chikmagaluru Hassan and Mysuru districts of Karnataka and Wynad district of Kerala are likely to rise in association with the forecasted rainfall. However, as the dams in the basins are having sufficient storage there may not be any immediate threat of high floods in downstream reaches. Dams around Nilgiri and Coimbatore districts of Tamil Nadu on river Bhavani and Moyar are also likely to get sufficient inflows during the next two days. However as there is sufficient storage available there may not be any immediate threat of floods. As the rainfall belt is likely to shift to foot hills of Himalayas from 1st September 2017 onwards except for isolated heavy rainfall warning in Tamil Nadu and Puducherry on 1st and 2nd September 2017, there will be general improvement in situation from 1st September onwards in all these basins.